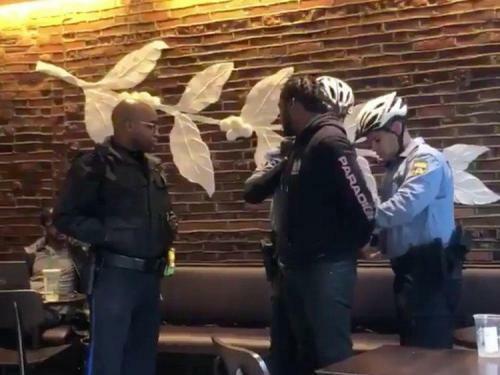 Starbucks suddenly finds itself in the hospitality business in the wake of the embarrassing PR nightmare in which two black men were denied the use of a bathroom and later arrested by police while waiting for an associate in a Philadelphia location. Now, thanks to a new policy announced by executive chairman Howard Schultz at the Atlantic Council on Thursday, any and all who wish to unburden themselves or simply take an invigorating sink shower at any of Starbucks' nearly 27,000 locations - whether they are paying customers or not - can make use of Starbucks' repenting facilities. While Schultz told the audience "we don't want to become a public restroom," he added "But we're going to make the right decision a hundred percent of the time and give people the key, because we don't want anyone at Starbucks to feel as if we are not giving access to you to the bathroom because you are 'less than. 'We want you to be 'more than.'" In short, Starbucks is now America's largest public restroom. As Schultz unveiled his business mode pivot, he told the audience that the world is “questioning the moral leadership of America” and, ironically, urged the public to reject nationalism. “The aspiration was to build a different kind of company, a company that would achieve the balance between profit and conscience, a company that would demonstrate that not every decision is an economic one, a company that would demonstrate success is best when it's shared,” he said. In the afternoon, Schultz participated in a discussion on “The Role and Responsibility of a Global Company,” in which he addressed the controversy surrounding the arrest of two African-American men inside of a Starbucks store in Philadelphia. “Our stores are not public bathrooms, but they’re used as such. In this particular case, two African-American gentlemen came in the store – like millions of other people – to sit down and have a meeting and one of them asked to go to the bathroom and we have kind of a loose policy around you should be able to use the bathroom if you buy something and it’s really the judgment of the manager. And in this particular case, she asked the gentleman: Are you a customer? And he said, no. And they go into a conversation and one thing led to another, and she made a terrible decision to call the police,” Schultz recalled, in the context of Schultz virtue (or perhaps virtually) signaling the rejecting nationalism. Video of the Philadelphia arrest went viral, sparking public outcry against the coffeemaker along with accusations of racism. In the aftermath of the incident, the manager who called the police was fired, and each of the two men settled with the city for $1 each and the promise of a $200,000 young entrepreneur program organized by local officials. In addition to the bathroom policy, Starbucks will be closing more than 8,000 U.S. shops on May 29 to train nearly 175,000 employees in "racial bias education." COO Rosalind Brewer, a black woman, told NPR that the incident was "a teachable moment for all of us," saying that as an African American executive who has a 23-year-old son, she found the viral videos of the incident painful to watch.